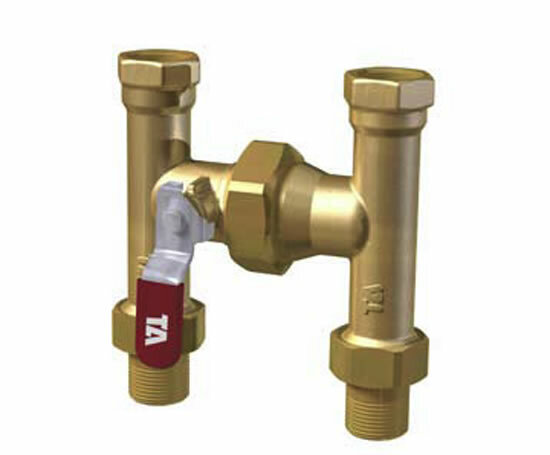 The TA Fast-Fit II is an H-type terminal hookup manifold with a built-in flushing bypass facility that is suitable for heating and cooling systems. It is made from AMETAL®, a dezincification-resistant alloy that minimises the risk of leakage. The manifold is compact and can be quickly and easily installed. This reduces installation and commissioning time on site, which makes the manifold particularly suitable for fan coil or chilled beam commissioning. Fast-fit II can be connected to a single terminal unit that is configured according to the requirements of the system. Available options include pressure independent balancing control valves, manual venturi balancing valves, and combined balancing and control valves. Additional isolating valves, drains and strainers can also be requested.